Unfortunately, many statues intended for the Florentine church (Medici Chapel) by Michelangelo could not be completed. And some of the numerous statues created by the master for this purpose also did not adorn the tomb. Particularly distinguished among such works is the figure of the “Crouching Boy” (the Boy Squatting on Squat), which is now in the Hermitage Museum of St. Pererburg. This small marble statue today is considered by many to be one of the most striking examples of the fantasy of an Italian sculptor that is rather bold in terms of plastic solution. After all, he decided to place a human figure in a marble block, made in the shape of a small cube. And I must say, he did it quite successfully. This sculpture of a squatting boy is not quite finished. The bottom is processed only tongue and the top of the statue is a little smoothed. 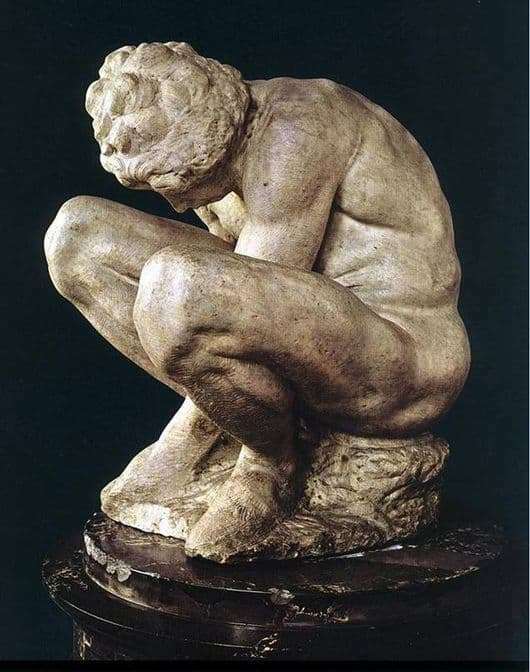 The very pose of this figure is rather unusual: a boy squatting and bending over, squeezing his fingers on his right leg with his hands, it can be assumed that he pinches the wound in order to stop the blood flowing from there.